With the fall of France and the war becoming worse for Britain, it was time for the Lockwood children, 12 year old Cecily and Jeremy, 14, to leave London. So it was off to Heron Hall, to their Uncle Peregrine Lockwood's estate, with their mother, Heloise. Traveling on the train to the same village were groups of school children also being evacuated from London by the government. These school children are taken to the town hall and as Cecily watches them leaving one by one with women who were to care for them for the duration, she asks her mother if they couldn't also have a child. May Bright, 10, seems to fit the bill, despite her indifference towards Cecily. Feeling powerless and picked on by her brother, Cecily wants someone that she can control and have power over. But May is an independent child with a mind of her own. And though she isn't impressed that her new luxurious surroundings at Heron Hall are more than she is accustomed to, it is the vast fields and woods that attract her. And in among it all are the remains of Snow Castle, a once beautiful castle made of white marble, where she meets two young oddly dressed boys. At first, believing they are evacuees running away from an unpleasant placement, it soon becomes apparent that something else is going on with these two boys. When May and Cecily ask Uncle Peregrine about the castle, he begins to tell them, little by little each evening, the haunting story of Richard III, of his brother King Edward IV's death, of his two sons, the eldest of whom is next in line for the throne and how Richard had hidden the two boys in the Tower of London in order to make himself King. Meanwhile, Jeremy, frustrated that he can't do anything to help the war effort but hid out in the country, he wants so very much to make his mark on the world. Each day, Jeremy reads the newspaper accounts of the war, becoming more and more exasperated that he is not there help. And so one night, he runs away to London. There, he discovers a burning, war torn London that he could never have imagined. Stunned by what he sees, feeling smaller than ever, Jeremy manages to do the very thing he sets out to do - help the war effort. It is his coming of age moment and Jeremy returns to Heron Hall a very different boy. No one can turn a phrase, creating a hauntingly brilliant story quite like Sonya Hartnett can. Gracefully creating lyrical phrases, and characters that are hard to forget as you begin to recognize parts of yourself in each of them. There is spoiled, selfish Cecily, who, the reader thinks, will grow up to be just like her shallow, socialite mother, Heloise, but who surprises us so often; May, quiet and thoughtful, careful but unafraid, she becomes a favorite of Uncle Peregrine (kindred souls? maybe); Jeremy, on the cusp of becoming a young man and wanting to get there way too soon - all so realistically and captivatingly drawn. The Children of the King is the story of the powerlessness of children and the people who want to control them - of the two princes at the hands of Richard III who craves power and control, of England's children at the hands of German bombs, sent by a dictator who also craves power and control. But it is on a smaller scale that we see how little power and control others really have over us unless we let them. Despite all Cecily's attempt at controlling May, she is the one who remains an independent spirit. And it is by running away, that Jeremy discovers the power each of us has to change another person's life. Just as she did in The Midnight Garden, Hartnett once again uses the device of magical realism and of a story within a story. Here, they is used as a means of connecting past and present, reminding us that the past is never past, it lives in the present or as May tells the two boys in the castle "Everything is connected…We are here because you are here. 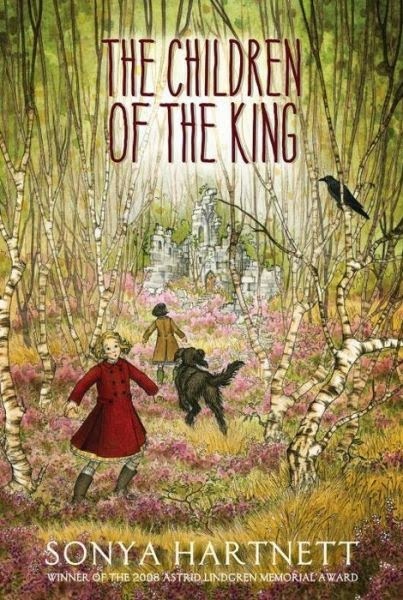 "And the dialectic that Hartnett creates in The Children of the King is just wonderful. I should tell readers that there are a few graphic descriptions when Jeremy goes back to London, giving a sense of realism, but not graphic enough to scare away middle grade readers. And one does not need to already know the story of Richard III to understand Uncle Peregrine's story, he weaves in enough of it for readers to understand it perfectly well. I put off reading this novel because I was afraid that I would be disappointed. The Midnight Garden was such a brilliant book, had Hartnett set her own bar too high? No, the bar is high but The Children of the King is right up there. But, in the end, all I can says is fans of Sonya Hartnett, rejoice! To those who will be reading her for the first time with this novel, you are lucky ducks.